You all know I’ve been trying to incorporate color into my eye looks, but it’s so hard with all of the seductive neutrals that are so popular right now. When I stumbled upon the brand Colour Pop and their $5 Super Shock Shadows, though, I was inspired! 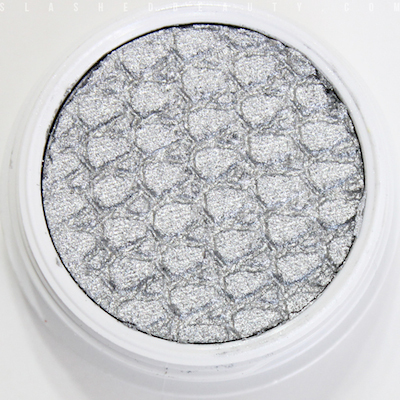 The Super Shock Shadows are highly pigmented and smooth eyeshadows. I chose six shades that could help me create dramatic looks together, or to use as pops of color on their own. 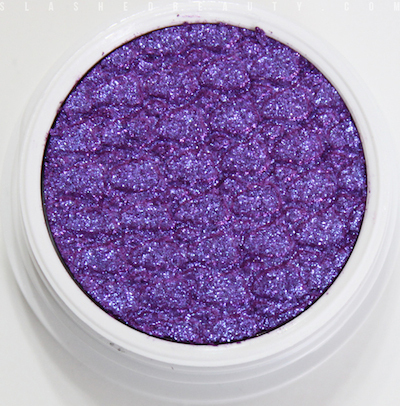 Dare is a super vibrant royal purple with pink and violet sparkles. In most light, it looks like a deep pink. Kimono is a deep cobalt blue with blue and violet sparkles. 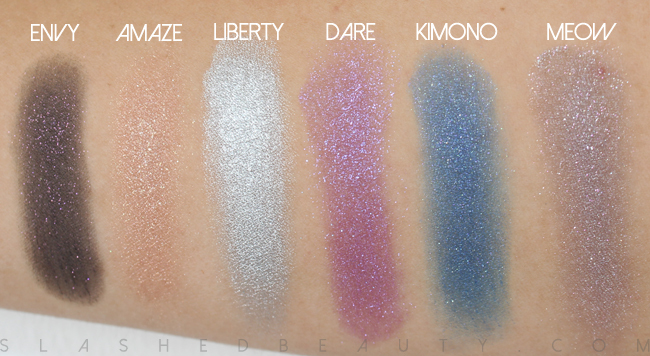 Liberty is a very bright, metallic silver. 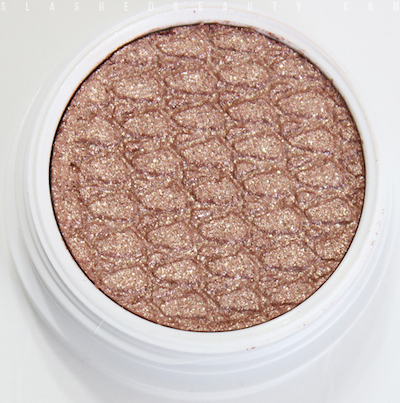 Amaze is a beautiful shimmery rose gold. It’ll spice up any neutral look times ten! Envy is a black with heavy, purple glitter. Meow is a unique marbled shade with splashes of pink, black, and silver. Mixing all the colors together will get you a holographic glitter effect. Cool on its own, awesome on top of other colors! All of these are strikingly rich shades that apply extremely smoothly. The formula seems like a cross between a powder and a cream… a mousse with a powder finish, perhaps? They are very soft, and it doesn’t take more than a tap of the finger to pick up a lot of color. 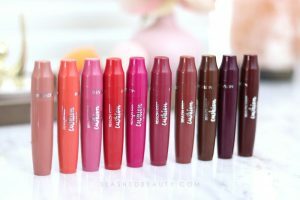 Colour Pop suggests to apply with the finger or blend out with a synthetic brush, and to shut the packaging super tight after use to keep the formula fresh. I found that using my finger gave the most even and pigmented application. I got all-day wear time with only a tiny bit of creasing on my oily lids with the Super Shock Shadows. At the end of the day, the color was just as bright as when first applied. The only downside, albeit slight, was that the sparkly shades seemed to transfer glitter to the top of my eyelid after some time. Other than that, they didn’t budge– even the swatches didn’t want to come off under running water! 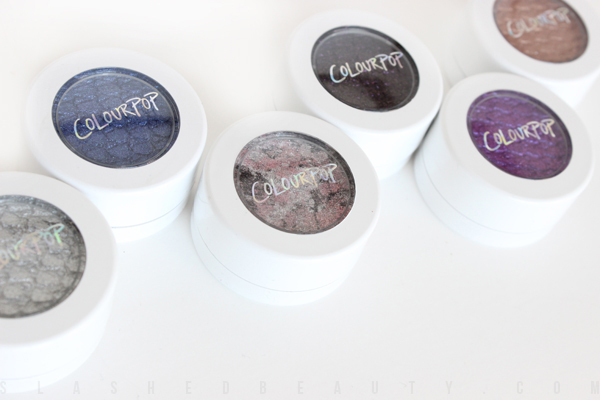 With the variety of intense shades, strong color payoff and downright cool formula, these $5 eyeshadows are a win for me. 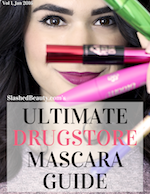 They’re unlike anything I’ve found across drugstore and high-end collections alike. These would make fantastic palettes… get on that, Colour Pop! Is meow discontinued?! I cannot find it on the website! Ahhh I just did a quick search and it looks like it is 🙁 Such a bummer because it’s a beautiful shade!! Ooooh Meow looks super nice! I haven’t seen this brand before. I love how Meow looks in the pot – don’t you wish that there was a way to transfer that look to the eye? Envy is so pretty too. Can’t wait to see what you do with them! 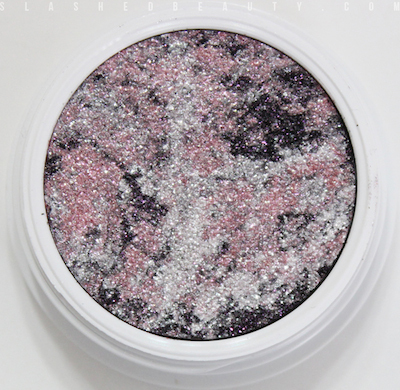 I am so wowed by these shadows – definitely a win for $5. I am in love with Amaze. 😀 You would love Desert too… I just got the new Beach Collection and I’m loving the colors in there too. I want Amaze in my life!! Dare, Kimono and Liberty are great choices to add some color!! They almost look like loose shadows. Envy looks so up my alley. I’m a POP lover but I have yet to try any of their eye shadows. Dare and Meow are super gorgeous! I love Colour Pop! I’ve purchased a ton of their eyeshadows. Ah, will fix that now! Ya’ll should definitely put together some palettes, though! oh my gosh! I can’t wait to see what you create with these! 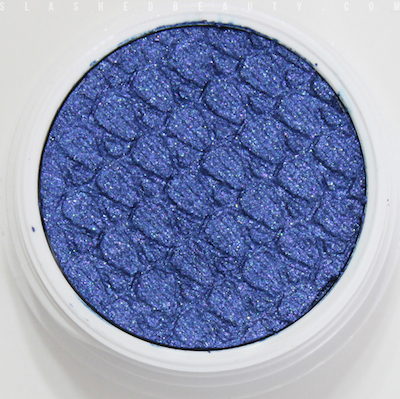 I’m dying for an EOTD! I’m drooling at the picture of “Dare” in the pan. So, so pretty.